It ain’t easy being green. Sadly, frogs and other amphibians are facing unprecedented population declines, and local extinctions, on a global scale. These precipitous declines have been attributed to a myriad of factors, including habitat destruction, pollution, pesticides, invasive species and the spread of infectious diseases. While habitat destruction is certainly the driving force behind this disturbing phenomenon, in recent years a great deal of attention has been given to the role played by pathogens, and in particular the amphibian chytrid fungus, Batrachochytrium dendrobatidis. The fungus kills by interfering with the composition of the host’s skin. Infected skin cells start accumulating the protein keratin, the same protein found in your skin and hair. This process, known as hyperkeratosis, essentially causes the skin to become thicker and tougher. This might not seem like a lethal problem for us mammals, but it is extremely bad news for amphibians. Unlike us, amphibians have semi-porous skin, across which they can absorb water, electrolytes and respiratory gasses. Hyperkeratinised skin however is far less permeable and cannot perform these functions effectively. This leads to a depletion of electrolytes, such as potassium and sodium, which play a vital role in muscle contraction. As these ions are depleted, the cardiac muscle of an infected animal cannot maintain normal function, leading to an irregular heartbeat and eventual cardiac arrest. 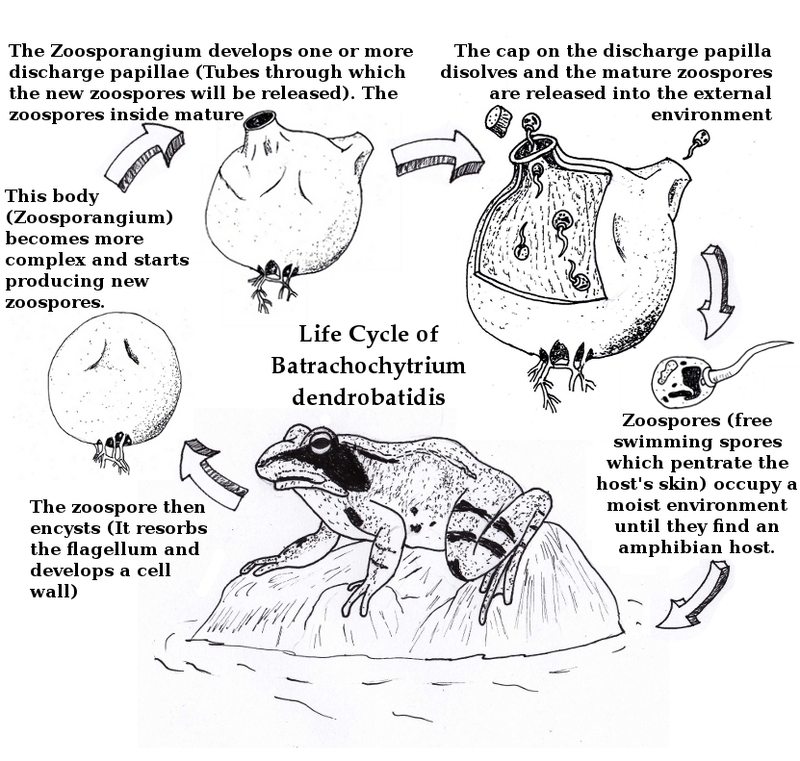 Fungi of the phylum Chytridiomycota typically infect invertebrate and plant hosts, with B. dendrobatidis being the only documented case of a chytrid infecting a vertebrate. 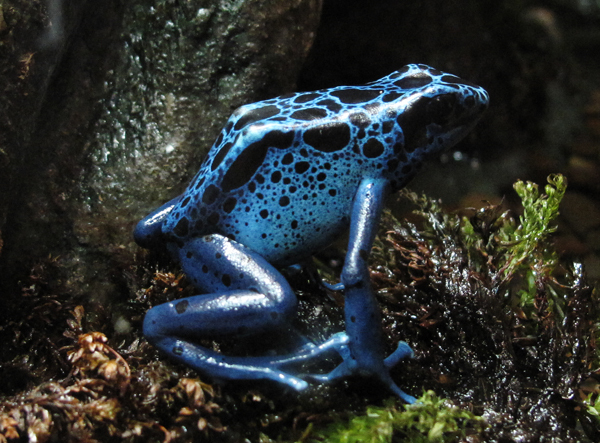 The fungus was first identified as pathogenic in the late 90’s, following an inspection of a blue dart frog (Dendrobates azureus) that died at the National Zoological Park in Washington, DC. It soon became apparent, that the disease had been affecting amphibian populations worldwide for some time before this discovery. The exact origins of the pandemic are unclear, however it has been speculated that frogs of the genus Xenopus were likely vectors during the early stages of the diseases’ spread. 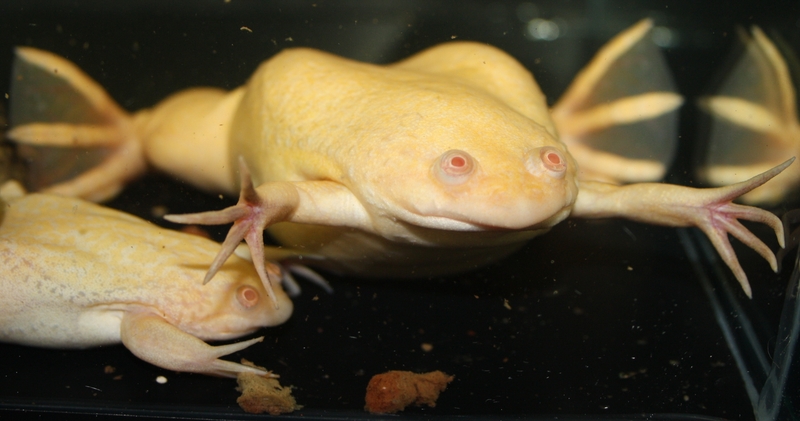 Xenopus frogs were transported worldwide in the early 20th century, due to their widespread use as as pregnancy tests. When the frogs were exported out of Africa, they may well have brought the fungus with them. The global trade in amphibians has facilitated range expansion for this prolific disease, but it may also have served to facilitate the hybridisation of different strains of the fungus leading to the production of a hyper-virulent strain. The life cycle of the fungus has two main components; a motile zoospore stage and a sessile zoosporagium stage. During the zoospore stage, the fungus is free swimming and superficially resembles a sperm cell. Like a sperm cell, the spore posesses a flagellum which allows it to travel short distances in search of a host. The fungus is also attracted to a host via a process known as chemotaxis. During this stage of the life-cycle, the spore occupies a cool, moist environment until such time as it comes in contact with amphibian skin. When a host is detected, the fungus penetrates the skin and encysts (the flagellum is reabsorbed, and the spore develops a cell wall). The cytoplasm of this cyst undergoes mitotic division, producing many new zoospores within the cyst. As these zoospores develop, the cyst forms a tube known as a discharge papilla. 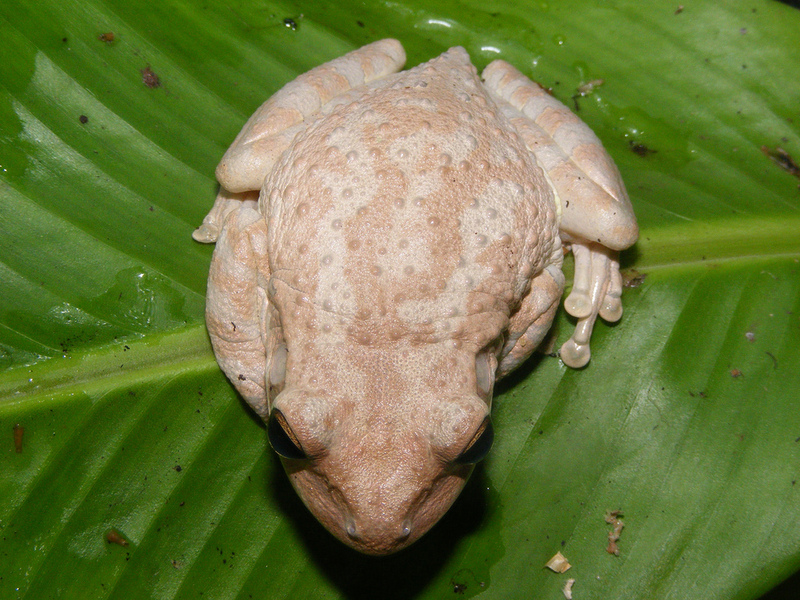 This tube usually breaches the surface of the amphibians skin, connecting the cyst to the external environment. The mature zoospores can now be released and will occupy a water body until such time as they find a new host, or they may infect the original host, compounding the infection. In the fight to understand and battle this terrible disease there hasn’t been a great deal of good news to report. One study has found that water-bodies containing an abundance of microfauna such as Daphnia and Paramecium may help to reduce infection rates as these organisms consume the free swimming zoospores. Unfortunately, putting this information to practical use in field is not currently feasible considering the implications that altering microfaunal communities may have on the ecosystem. A study published recently in Nature may have highlighted a more practical avenue for conservationists to pursue…innoculation. Recent research, performed at the University of South Florida, has shown that some frogs develop increased resistance to the fungus following survival of an initial infection. The researchers innoculated Cuban tree frogs (Osteopilus septentrionalis) with the fungus and then cleared the infection using elevated temperatures. With each subsequent infection, the frogs displayed increased resistance to the infection; they even managed to combat the fungus’ immunosuppressant qualities to an extent. A similar experiment performed on booroolong frogs (Litoria booroolongensis) did not yield such promising results. However, the methods used to clear the infection differed between the two experiments. The research performed on the booroolongs used a fungicide, itraconazole, to clear the infection and there is evidence to suggest that the fungicide may have immunosuppresant effects on treated animals. As the more recent study utilised heat treatment to clear the infection, the animals may have a better chance of mounting an immune response. Obviously, deliberately infecting amphibians with a deadly fungus is not a viable management strategy. True vaccines utilise non-viable, rather than live, pathogens to help induce immunity, so for this research to have applicable benefits, the frogs would need to respond well to dead fungus as well. Thankfully, they do. 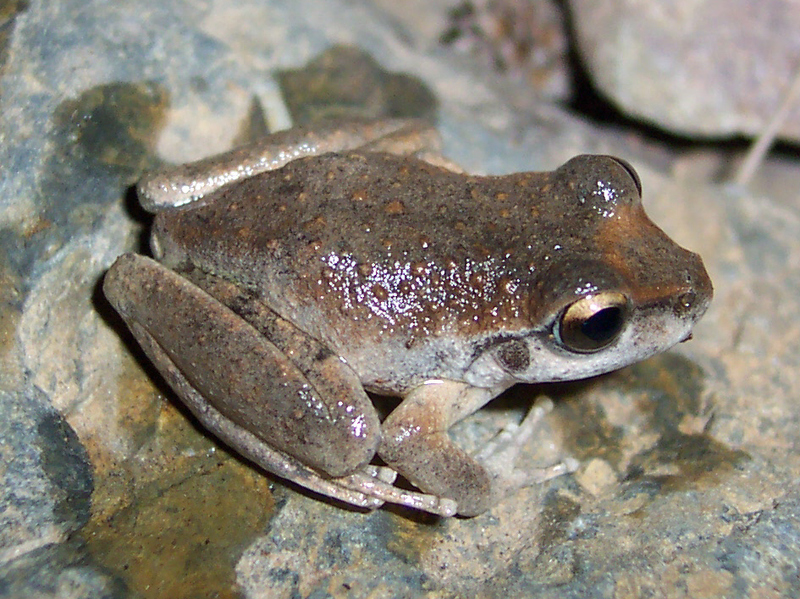 Frogs inoculated with dead fungus displayed almost the same level of resistance to subsequent infections as those infected with the live fungus. The bad news is, even with increased resistance, survival rates for infected frogs are still quite low. While the news is not as positive as conservationists might have hoped, it could prove to be an impressive first step towards developing a management strategy that is applicable in-field. For example, dead Chytrid could be introduced to water bodies to help boost survival rates on a population wide level. This is all very speculative however, and while any victory in the battle against Chytrid is welcome news, the truth is this disease will continue to decimate amphibian populations while we struggle to find a meaningful way to mitigate its effects. More importantly, if we don’t address the more pressing issue of habitat destruction, for many species it won’t really matter if we find a cure. Source: McMahon, Taegan A., et al. “Amphibians acquire resistance to live and dead fungus overcoming fungal immunosuppression.” Nature 511.7508 (2014): 224-227. All other media has been supplied by The Herpetological Society of Ireland, and this post contains sources and material originally printed in their publication Lacerta.